Niagara Falls, NY - Niagara University Director of Athletics Simon Gray talks about the hard work put into creating the John P. Bobo field renovations during a ceremonial groundbreaking at the baseball field. 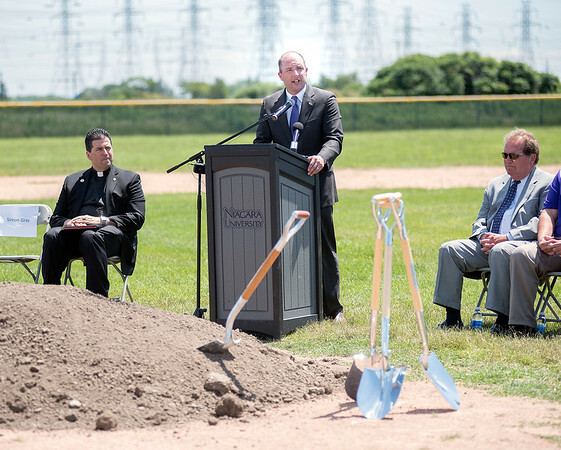 NIAGARA UNIV., N.Y. – The Niagara University Department of Athletics will host a groundbreaking event to celebrate the start of renovations at John P. Bobo Field on Tuesday, July 18 at 1 p.m. Members of the local community and media are encouraged to attend as renovations at the home of Niagara Purple Eagles baseball officially begin. The enhancements to the field will establish a great asset for Niagara University and the greater Western New York community. The renovations will improve the student-athlete and fan experience and help the team overcome the challenges of the Western New York climate. During much of the winter, the weather's effect on the field moves the team's practices inside, negatively impacting preparation for the varsity season. Having a state-of-the-art facility will be a significant recruiting advantage for the program, making Bobo Field one of the premier on-campus facilities in the region. The project highlights include a full synthetic turf field, expanded seating areas, a new scoreboard and dugouts, a press box, and a new backstop with netting. The renovations are scheduled to be completed this fall, with the team taking the brand new field in time for the 2018 season. The Purple Eagles baseball team is coming off its best season since 2006, finishing the 2017 campaign with an overall record of 24-24 (12-12 MAAC). Pitcher Daniel Procopio (10th round, Los Angeles Angels) and outfielder Tanner Kirwer (20th round, Toronto Blue Jays) were selected in the 2017 MLB Entry Draft in June. Freshman pitcher Matthew Brash was named the MAAC Rookie of the Year, while Kirwer and pitcher Cody Eckerson (All-MAAC First Team) and shortstop Greg Cullen and outfielder Trevor McCauley (All-MAAC Second Team) earned all-conference honors in 2017. Stay connected with the Purple Eagles through social media. Follow Niagara Athletics on Twitter @NUPurpleEagles and @NiagaraBASE. Check in with the Purple Eagles on Facebook/PurpleEagles and on Instagram @NUPurpleEagles.